The Lane Keeping System is your silent coach that helps you stay in your lane. The system uses three strategies: wheel vibration, steering torque and drive pattern monitoring/alerts. Wheel vibration indicates you're veering close to lane markers. 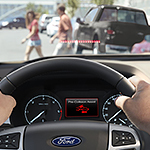 Steering torque helps you steer back to the center of your lane. Drive pattern monitoring entails a forward-facing camera mounted behind the rearview mirror. The camera monitors your driving patterns, issuing visual and audio warning signals if you appear to diverge from your normal driving pattern.